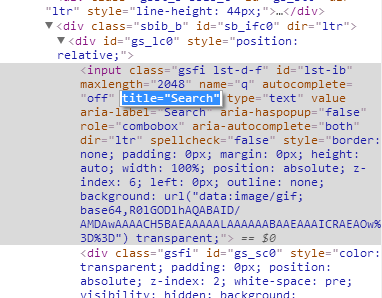 BAS allows to search element in different ways: css, markup part, xpath, coordinates. By default unique element selector will be generated for you automatically and you don't need to bother about it. This widget will appear on any action, which is executed on element. Widget is located on the upper right corner. All css selector are preceded with >CSS> prefix, this prefix tells BAS, that developer uses CSS. Several >CSS> prefixes may be combined. You can find element with index using >AT> prefix. It is important to avoid using additional spaces with >MATCH> prefix. All spaces becomes part of selector and may affect result. BAS allows to use xpath selector with >XPATH> prefix. Xpath queries inside certain element must be relative(must start from dot).